This original painting is available to purchase. When you make your selection, click on the Add to Cart button to finish your purchase. This site will be updated if this image goes into print. Free shipping for this original painting! This painting was created when Joan was invited to the San Diego Zoo as a featured artist for their Garden Celebration in May 2013. On the day this painting was started, a new baby giraffe was born at the Zoo. The name of the giraffe is Penelope. 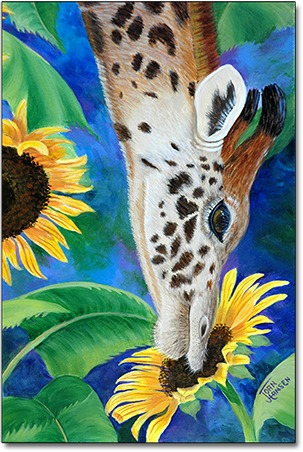 So, this painting of a giraffe exploring sunflowers is now called "Penelope's Friend." Joan went to the giraffe enclosure to meet the new baby giraffe on the day she was born.